Stuff always happens to my kids on the weekends when their pediatrician's office is closed. I kid you not, for the past 3 weekends there has been something warranting a doctor visit (if only to calm my nerves) that has had to wait 'til Monday. Somebody is playing a joke on me, right? 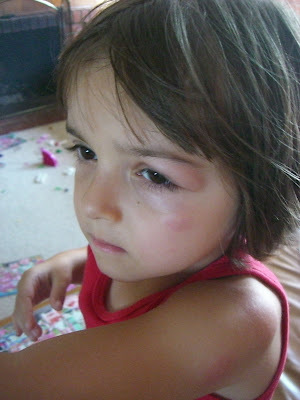 Yesterday morning Raquel was playing "gymnastics" on the furniture when I noticed she had been bitten up by mosquitos some time during the night. These red blotches were HUGE! There was one on her cheek that made her look like she lost a fight. These bugs pretty much went to town on any exposed skin they could find and for some reason most of these bites were bigger than a quarter in diameter. Jose came home from work earlier than expected and took us to lunch at the Montebello Town Centre and afterwards we walked around window shopping. We went into The Raider Image store and Jose says, "Hey, Sarah, did you notice her eyelid?" 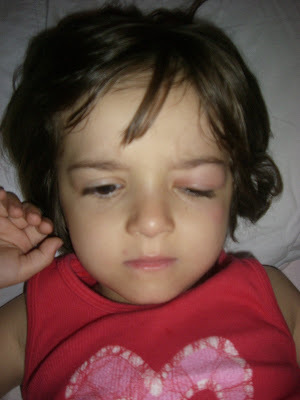 Raquel walks over to me and I see that her left eye lid is swollen (I assume from another bite) which happens to be on the same side of her face as the mosquito bite that makes her look like she lost a fight but now it looks even more so like someone beat the crap out of her. And we're in public, at a mall, on a Saturday. Just great. Jose and I looked at each other and as if he read my mind he said, "We can go home now." I think if we were not in such a ghetto mall someone may have noticed Raquel's face and assumed the worst. No offense, Mall. Well, we went home and Raquel took a nap. She woke up looking worse. The eye opening was smaller as the lid was swelling more. Fortunately, the bites look worse than they feel. She doesn't seem to know they're there. Here's what she looks like this morning. She had a breakfast date this morning with her babysitter so I had Raquel hold ice on the lid to see if it would relieve the swelling. Nope! So she's out in public right now looking like this. 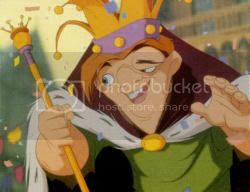 It's a good thing she doesn't have a hunchback. As it turns out, the screen for Raquel's bedroom window had mysteriously fallen off (or been removed) which I believe is the culprit for the mosquito feast/attack. Her Uncle James was the one to bring this to my attention and fix it, too. Problem solved! oh my gosh poor baby! Hopefully she isn't allergic to whatever bit her. I know what you mean about things always happening on weekends when you need to go to the doctor, but I know it will be a much worse feeling when it's my kid not me. by the way, mom said anti-histamines would work to calm it down since it is an allergic reaction. 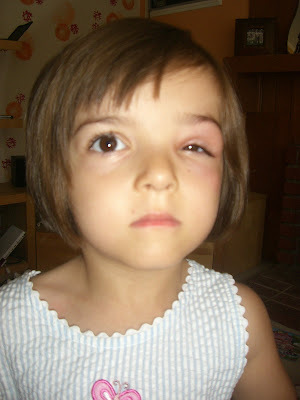 I take loratidine, but you'll have to see how much you can give a 4 yr old..does it itch? no, she hasn't itched it at all. Weird. It looks much better tonight. Oh baby :( OH no! I am glad it's not bothering her, at least. Oh my goodness. Thanks to James for fixing the screen. That is a really sad picture. Hope she gets better soon.